What produces electromagnetic fields (EMF)? Cell phones, laptops, tablets, baby monitors, Gameboys and any other wireless device. Electromagnetic fields are all around us. In their natural form they are harmless. But when electromagnetic fields are man-made, they have been scientifically proven to disrupt the DNA structure of our bodies and wreak havoc on our health. In a study funded by the telecom industry to prove the safety of cell phones, it was revealed that cellular damage and tumor growth can be induced in a laboratory setting using radiation levels one-third of those listed on FCC’s exposure guidelines. Another report issued in 2010 by the International Electromagnetic Field Cooperative found a 420% increase in brain cancer rates among children who began using mobile and cordless phones as teenagers, as opposed to those that did not. Bio-Life Laboratory in Trinidad ran blood work on subjects using cell phones. 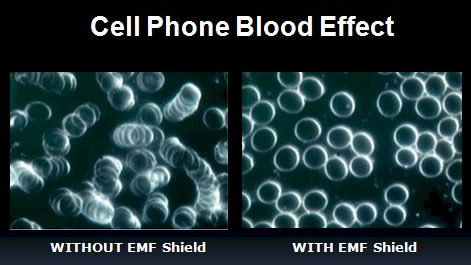 In the left image above you can see how the radiation and electromagnetic frequencies (EMF) emitted by cell phones cause the disorganization of red blood cells after a 15-minute cell phone call. The result? A loss of oxygen leading to poor circulation and giving rise to microform populations. These microforms (yeast, mold, bacteria) feed on nutrients, causing deficiencies in your body. They also increase the acidity of the blood plasma by excreting into the blood. The image on the right is a sample of live blood after a 15-minute cell phone call, using the Aulterra cell phone disk. Blood cells remain stable. Cell phone radiation is also linked to conditions in which blood cells leak hemoglobin, and possibly also open up the blood-brain barrier to invasion by toxins and viruses. Treats up to 5,000 square foot homes. Affects electrical wiring and all appliances permanently plugged into an electrical outlet. Add an Aulterra disk to the end of the plug to boost its capability. This is the upgraded 2016 plug version. Aulterra energy pillow neutralizes the effects of toxins on your body. Pillow size is 6 1/2 " square and contains 1/2 pound of Aulterra powder. Aulterra powder can increase nutraceutical effectiveness. Available in a one pound container.